Italian beef is a kissing cousin to the French dip sandwich (purportedly, it originated in Los Angeles), served “au jus”. 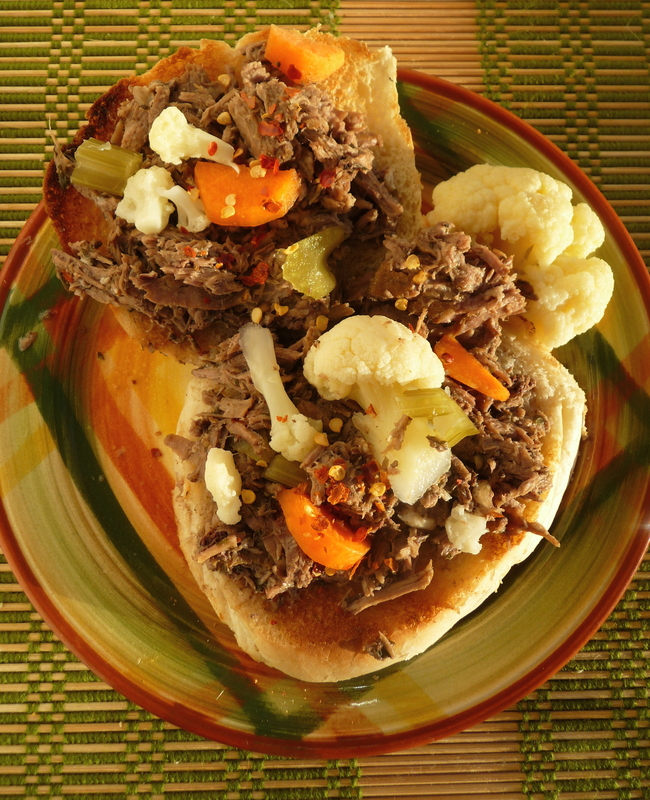 The difference is that Italian beef is served with a more vinegar-y sauce, hot and/or sweet bell peppers, and giardiniera, a mixed pickle of bite-sized pieces of celery, carrot, cauliflower, pearl onions, spicy peppers, as well as red and green bell peppers. In Chicago at an Italian beef stand, one would order a sandwich with hot peppers well-soaked as “Italian Beef, hot and juicy” – or “sweet” for the sweet peppers – in the correct local slang. The distinctive hot-vinegar-garlic-spice blend imbue the beef with superb and complex umami flavours. Using the abundant gravy in which the beef roasted, the bread can soak up an excellent counterpoint to the tender, fall-apart shreds of beef, contrasted by the crunchy and chewy giardiniera. With a (relatively) lean beef base and lots of pickled vegetables, the Italian beef sandwich is rather light and more healthful – certainly compared to regional classics as Philly cheese steak sandwiches. It does include most of the major food groups…. 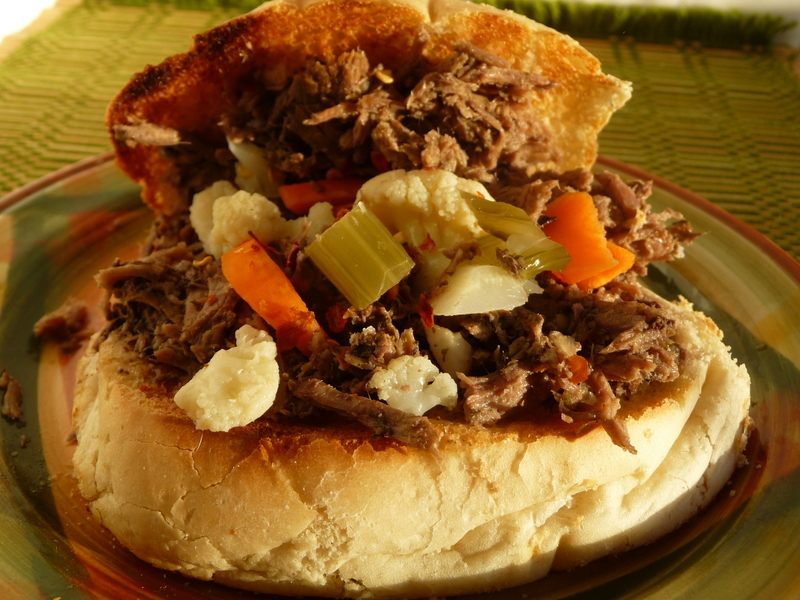 I have prepared Italian beef twice, adapting a recipe from my very favourite food writers, Jane and Michael Stern’s book, Roadfood Sandwiches, and another one for a slow-cooker version from Allrecipes.com. The only issue I would point out is that the roll or bread should be a soft but chewy and firm Italian bread, rather than the more crisp and hearty French baguette. However, it should not be too fluffy and delicate, or else the sandwich will disintegrate. One day, I hope to bake the right kind of bread, as the store-bought and bakery-produced versions I have tried here were not quite right. It is very simple to make and can feed a crowd for brunch (before watching a sporting event? ), lunch, dinner, or whenever one wants an authentic taste of Chicago. Before the recipe, I wanted to incorporate a couple of items I usually put in my Friday Food Facts and Fun feature, as it is Friday. It is a bit much to go from bittersweet chocolate to glazed donuts to pastrami sandwiches, with just a day in between – during the month of January, for that matter – do you agree? Use a small knife to insert the garlic slivers into the roast all over. Put the water in a deep baking pan not much larger than the roast. Add the roast and top it with the seasonings. Cover tightly with foil and bake for 2 hours, basting 3 or 4 times and adding water, if necessary, to keep plenty of juice in the pan. Remove the beef from the pan and let it sit. With an extremely sharp knife and a big fork, slice or shred the meat into very thin slices or small shreds, similar to pulled pork. Degrease the pan and taste the gravy – it should be highly seasoned with a peppery kick. Adjust the seasonings to-taste and add cup of giardiniera marinade from and mix in. Allow it to wallow at least 15 to 20 minutes before serving. Serve on rolls or lengths of Italian bread with roasted bell peppers and store-bought giardiniera. Heat two cups of water with one-half litre of chicken or beef stock until boiling, add the dried spices. Place water-spices in slow-cooker, add roast (prepared as above with garlic). Cook for 5-6 hours on low setting, basting every couple of hours, or whenever you are drawn in by the aroma…until fall-apart tender. Follow the shredding/slicing directions above. This entry was posted in Brunch, Friday Food Fun and Facts, Main courses, Recipes Misc and tagged beef, Brunch, Chicago, classic, Italian, lunch, Recipe, Sandwiches. Bookmark the permalink. Your sandwich looks really delicious and very decadent too! Thanks, Nancy. You are right about the delicious, but it’s not too decadent for calories or fat. Hi, Theresa. I would love to buy some local grass-fed beef (I used to buy some raised up in Pemberton while living in Vancouver), so I should get your source. You’d like the slow-cooker version of this recipe. It makes your house smell tantalizing all day and is perfect to greet dinner guests with the aroma. Once I get over my fear of frying, I can celebrate National Tempura Day. That is one holiday which deserves a big feast, I dare say. You’re welcome, Babygirl (which happens to be one of the nicknames for our other cat, Jinja). It is a great recipe – one which is surprisingly easy to do at home. So clearly this is something to try when I’m in the Windy City! 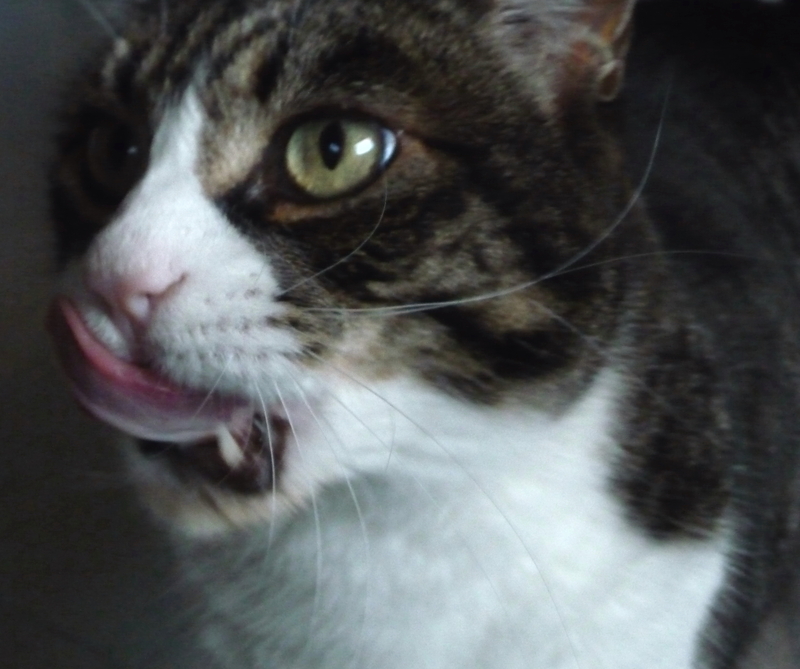 Looks delicious, and clearly George agrees! Hopefully seeing you, C & the cats soon, fingers crossed! Hi, Jax (I hope nobody said anything like that at Heathrow or Gatwick!). You’d enjoy this sandwich very much. Regardless of whether I can make my version for you when you’re out here, try Mr. Beef (Orleans Street) or Al’s #1 Italian Beef (various locations) in Chicago. Also, a visit to Pizzeria Uno or Due near north really would be the way to go in Chi-town! Thanks, Michele. I know what you mean about those sorts of cravings. We might be able to get some fresh lamb, raised just around the bay from us, if we are very lucky. In this case, I can hear the bleating from the lambs in the spring before they turn into various dishes elsewhere – but they have a wonderful “lambhood” with rolling meadows and great ocean views!!! I do have a wonderful lamb stew recipe, but I want to re-create a shepherd’s pie I ate at a new year’s eve potluck (with spinach, topped by sweet potatoes rather than the traditional white mash). Chicago pride! Dan, this is a really helpful post, in addition to being totally mouthwatering. I’ve only tried Italian beef once, and didn’t get the mass appeal; your post is a great explanation of it. I’ll have to try making the stuff myself now…that’s always the key in learning to love something, anyway. Hi, Maddie. I wonder where you tried the aforementioned sandwich? If you ever make it out to Elmwood Park, the best – I think – is Johnnie’s, along with a superb Italian lemonade (Italian ice). But, then again, the home-made version is superb, I have to admit…you will be able to find the right kind of submarine sandwich rolls easily, I bet. Oh my, this sandwich sounds like it was made just for me. What a delicious treat. Both of my brothers attended the University of Chicago by the way, it was fun to visit and watch the neighborhood change. I am going to have to give them a hard time as they never introduced me to a real Italian sandwich. I do not see it listed on your holiday schedule, which leads me to believe I can make my own date with destiny, which I will indeed do soon. Thanks again! Thanks, Louann. I wonder if you had pizza at Medici, Edwardo’s, or Giordano’s on your Hyde Park visits? I never had Italian beef around UChicago, as I was vegetarian for almost my entire time there, and I don’t think there was a good outlet for this sandwich near campus…though there was Harold’s Chicken Shack – another not-so-great vegetarian dining option. You do raise a good point about National Italian Beef Sandwich Day – a holiday which should definitely exist!!! Dan, what an awesome sandwich!!! But most i really enjoyed reading about your story how you became vegetarian and then had this sandwich. I have never been vegetarian and i don’t think i could it but i, just like you, don’t eat a lot of it. I just need to eat more fish than i do. If i could i would eat fish 5 times a week, but if i get it once or twice a week i am happy. Hi, Ewa. I do hope you try this at home, when you feel like classic Chicago comfort food. Seafood is something I could eat more frequently, too, and the summer is when I indulge more. Dan – Love the sandwich, and have ever since I was in Chicago on an interview…many years ago. My handler took me out to “dinner” after a long day of meetings … we stood on a street corner and scarfed down Italian Beef sandwiches. I turned down the job, but the sandwich gained an immediate place of affection in my heart. Thanks for the advice on Lily flour and the comment, Toby. I’m trying to recall if I ever had a “handler”, though I like the image of standing up to eat the Italian beef: this is the proper posture, after all! But now you can make it while frozen indoors in not-so-hot-Atlanta…..
Dan, you know the first pic of the sandwich is deliciously shocking! Funny you were vegetarian and now you try some meat. Hi, Gera. I have always wanted to have a deliciously shocking picture – or sandwich! That is a great description, which I will have to steal, um, borrow from you. Yes, the Italian beef sandwich is the foe of vegetarians everywhere…. Dan, I’m right behind you, on the long, omnivore line. This is one of my favorite sandwiches—followed by the French Dip (which is what I had for lunch, yesterday). Your delectable photos speak volumes, as always! Hi, Sol. Omnivores eat everything – that could have been a t-shirt in the 1970s. I am still wanting to try an original French dip in L.A., which I have not done on visits there. I’ve had too many poor imitations and only a few good ones. Have you eaten at Phillipe’s which is supposed to be the original French Dip in L.A.? Anyhow, the sandwich looks hearty, juicy and delicious. My whole fam. would appreciate this one and it seems very user friendly. Hi, Geni. Jane and Michael Stern love Phillipe’s, and I don’t know why I’ve never eaten there, while in LA (a couple of trips were during my vegetarian era…). It is a major place in American food history for the French dip! 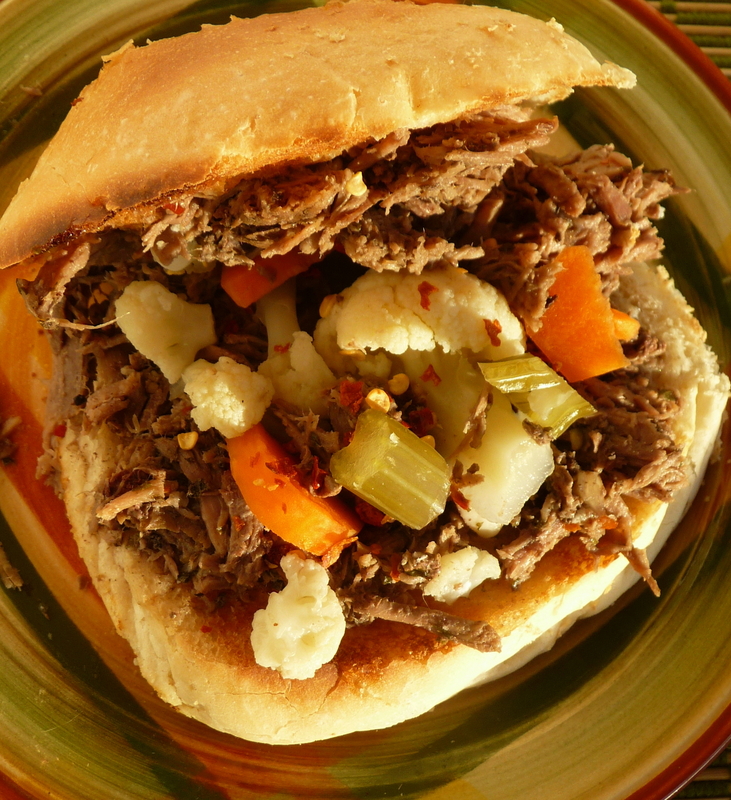 The Italian beef is similar but the vinegar’s acidity and giardiniera distinguish it from the more garlic-y French dip and make it habit-forming. The slow-cooker version is really easy, so you might like to try it out….